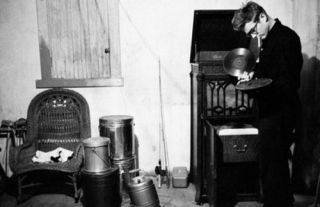 Record Store Day: 20 famous vinyl lovers | What Hi-Fi? Our Record Store Day 2014 celebrations continue with a look at stars of stage, screen and more who, like many of us, have a passion for vinyl records and record players. If you have any suggestions, do let us know in the comments section below. A peerless DJ and radio broadcaster, John Peel lived and breathed music right up until his death in 2004. Paul Gambaccini described him as "the most important man in music for about a dozen years" and it's no surprise he had a collection to match. A film and fashion icon, you could wish for few better advocates of vinyl records than a Hollywood great such as the wonderful Audrey Hepburn. A passion for collecting vinyl records? It's not unusual, is it Sir Tom? If you're a multi-award winning actor and listening to a crisp slab of vinyl, you'd be as content as Jack Nicholson looks here. As good as it gets? You bet! For some, Joan Collins is best known as a glamorous Hollywood actress; for others, as Blake Carrington's ex-wife in Dynasty. And for the rest, as a chocolate-starved diva in a Snickers advert. But for us, it's all about the vinyl collection above. If you were one of the most influential guitarists in pop music history, who would be on your playlist? Well, another guitar-playing pioneer in the form of Bob Dylan is certainly a good place to start. It's the late 1960s and Manchester City's footballing legend Mike Summerbee shows off his nifty Volvo P1800 sports car. And if you're going to pimp your ride sixties-style, there can be no doubting that a record player is a must-have piece of kit. Joe Strummer once claimed that listening to records of the Beach Boys (among others) was why he got into musc. And when you consider the enduring legacy of The Clash, we're grateful that he did. Some like it hot; some like a 45rpm. Being able to listen to our music on the move these days is something we've come to take for granted. But imagine being the King of Rock 'n' Roll and having to take a record player with you to enjoy music on the move... it'd be awesome. A sensational musical talent, Amy Winehouse's voice was one that took us back to the height of Motown, rhythm and blues, and soul; a time when vinyl ruled the airwaves. We'd make him an offer we'd think he couldn't refuse for this smart looking player, but then we'd reckon The Godfather would still find a way to refuse it. We're not entirely sure that Christina Aguilera was a huge record fan, but bonus points for the use of records to, uh, sell records, and the travel-bag-style record player. The Sharp V2000E (or is it V2500E?) boombox – a majestic piece of equipment. There is maybe a lesson for portable device manufacturers here that big can still be beautiful. Albeit probably not quite this big. Not content with being a musician, songwriter, producer and actor – and one half of the White Stripes – Jack White also owns Third Man Records. If you've never heard of it, it's a label that triumphs the fact "your turntable's not dead". Sadly no longer with us, Eusebio is regarded as one of the best footballers of modern times and was renowned for his fair play and humility. We'd also like to add that he had a fine eye for vinyl too. At some point, Prince Charles will become the UK's head of state. But until then, he has to keep busy. It looks as if he's got a little sideline in DJing going on here – if he's looking for a name, DJ Royal-T is our suggestion.